I have nearly concocted a tablescape. The roses virtually demanded a pretty table be set. I cannot keep plates and flatware symmetrical. How all of you do it is beyond me. So a nearly set table is as close as Olive gets. I hope the setting makes up for my imperfections. These two images above have the pastels toned down a little. I like this image the best and I believe it was one of the last I snapped. Hold Everything Lightly #5 will post on Tuesday April 17. They are not getting easier. Your tablescape is beautiful as it is, Olive. 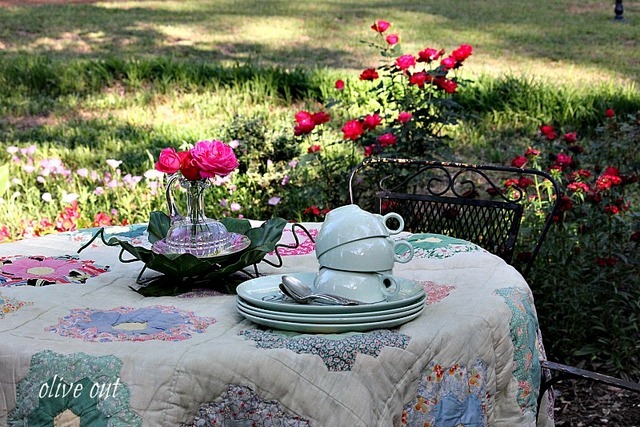 The setting is lovely and I like how you use the quilt as the tablecloth. My mom has the same patterned quilt that she quilted years ago. The table setting is nice Olive and the setting in the back yard is lovely. Love how you used the quilt. Isn't everything better when it's been gently used. The setting is beautiful, Olive. Love the quilt. I think you tablescape looks great. Believe me, I don't set a perfect table either. Delightful, Olive!! Your yard looks like a beautiful spot for a meal. Well you almost tablescape sure passes the test to me! The flower garden quilt is beautiful! The few of the birdhouse from the patio table is my favorite. I do declare, you get better and better! 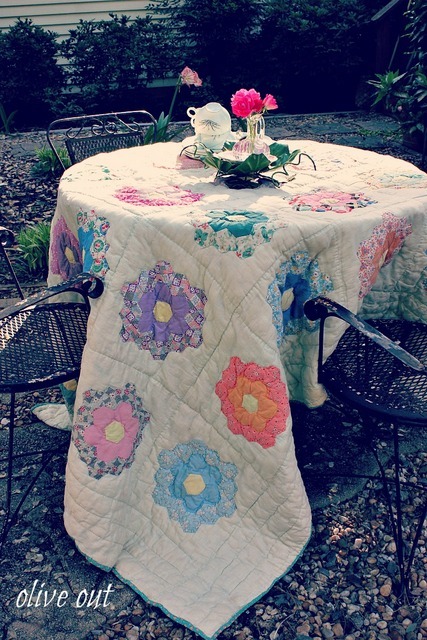 I love seeing a quilt used as a table cloth. I think your "nearly" set table looks great! Those roses, of course, are the crowning glory. I love everything about your tablescape Olive..after all every one of us starts by bringing a stack of pretty dishes to the table.. there is just something so inspirational about the way you have written and pictured this..makes me want to go set my table..and rarely do I feel that way when I see all of those 'perfectly' set tables..and I set my table every day with china and cloth napkins..I have so much ballerina chine..love it...bought way back when on ebay before anybody else had discovered it.. grin..
Everything is lovely! 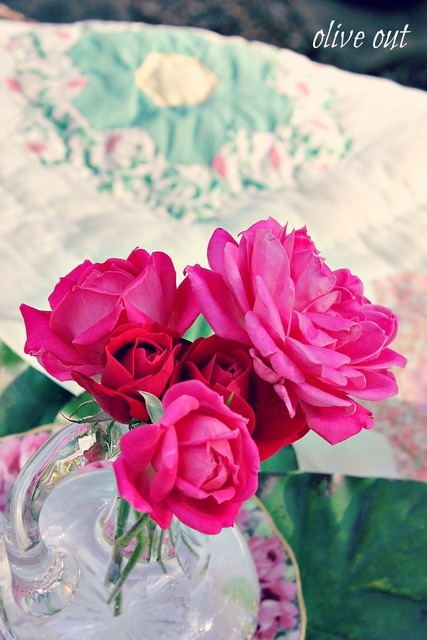 I especially like the quilt and beautiful roses! Olive, your nearly tablescape is perfect! 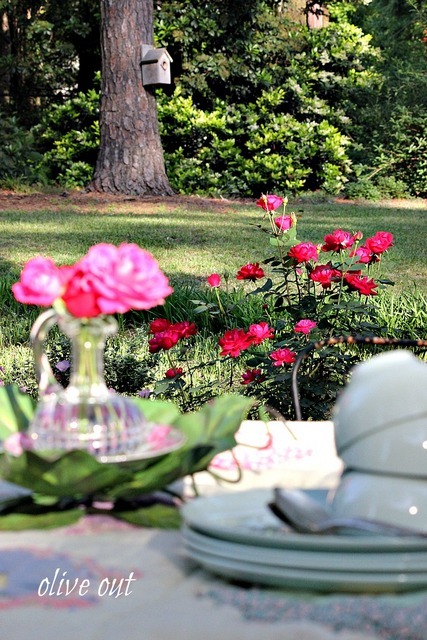 Your lovely backyard is the perfect setting and your roses are glorious. I really like your vinegar pitcher, it makes the perfect vase. Everything is wonderful and what a lovely way to celebrate spring! Lovely, pretty, serene little scene you have there. The shot of the two birdhouses really is nice. Anybody at home in the near one? Also, the picture of the quilt flowing off the table onto the gravel walkway is really fine... It makes me think of a waterfall on a mountain stream. Waterfall huh? You were there, remember. Thats just the sweetest little quilt! It's perfect for a table setting outdoors with the scent of roses wafting about. Very nice! Just beautiful.....and the quilt is so gorgeous too! What lovely photos, Olive...I would love visiting over that table! 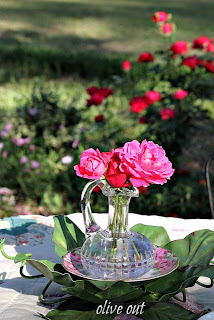 Now that's the kind of table I can manage...love the roses...ours are finally starting to bloom here. Have a great evening!! This is heart melting pretty! The quilt and the roses do it all for you. And you have done it my favorite way! Piles on the table. That's what you see in all the French decorating books! Lovely! Good luck with your writing assignment. I know what a challenge it must be. Love the quilt and the spoons are wonderful. I have a couple of teaspoons in that pattern. Very well done! What a lovely place for a tablescape. The quilt just makes it so perfect! Your roses are beautiful! And the image, of the quilt and the chair -- great contrast there, the soft and the chippy. One of the things I do like about taking digital pictures is that welcome surprise you can find in amongst the dozens of shots -- that angle or composition that catches your imagination and makes you say, "Hey! Sweet!" What a pretty series of photos. It's a beautiful table Olive. You should link this to Kathleen's Let's Dish this week. It's an Earth Day/Good Earth challenge. Your table is perfect! I put my table together and after all the pics were done I noticed a stray knife. That's okay...'cause that is life! :-) Posting it tomorrow. Olive, what a sweet post! Love your use of the quilt as a tablecloth. I love it! I think it looks lovely. Your quilt is gorgeous! Beautiful tablescape!! 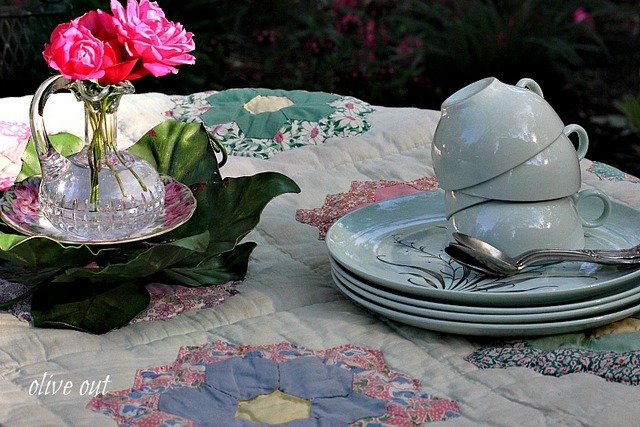 Love the quilt as a tablecloth. Geat ideas and photos..
You set a very pretty almost table! Love that quilt. I have the same problem with silverware and such on the table. It looks good until I take a photo and realize it doesn't look right in the photos. I know I have been here as I am a follower, and I thank you for following me too! I love your almost table. The quilt is beautiful, and the garden in the background is just beautiful! What a great place to celebrate Earth Day. Thanks so much for Linking to Let's Dish. You can show us dish collections, anything table related! We don't mind the fork being askew, it is all about having fun playing with our dishes! Welcome to the club! Now finish that table, it will be glorious! You are one of the tablescaping giants on whose shoulders I stand Mary. What a lovely quilt and those dishes are so pretty!! This is a beautiful setting! No matter that it is not a "completed" tablescape...the simple suggestion that a table is about to be set it just enough. The roses are such a pretty hue, and the dishes & your Aunt's flatware are pretty, pretty, pretty!!! The quilt was a spectacular thrift store find! I have never found anything like that!!! Beautiful! It looks like summertime :) I wish I was there sat at that table! I love the quilt. 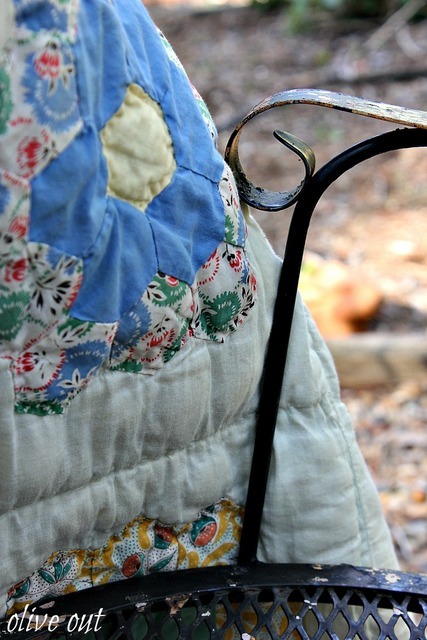 Beautiful quilts and lovely photos -- I really enjoyed this post. Love the quilt and imperfections are perfect! Olive, this is the lovely! 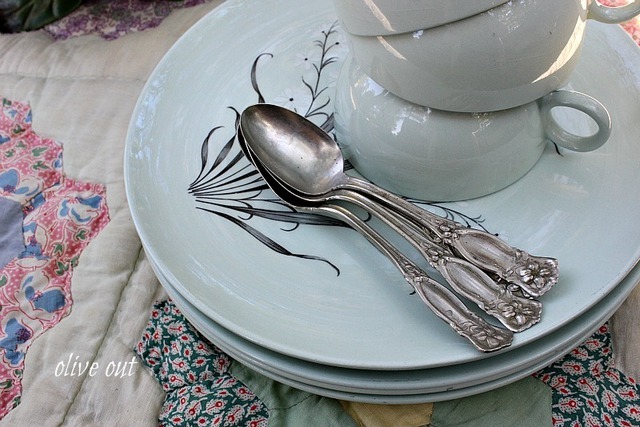 Beautiful quilt, dishes, and silver. Perfect details! I adore that last photo too. Great shot! What a lovely setting and quilt!